❉SPECIAL DESIGN❉ Quick reference information/2018-2019 calendar overview/2018-2020 Holidays/Name, address and numbers/Full 360 degree fold over A clear previous and next month reference calendar/The festival will be marked on the corresponding date/ Weekly and monthly planning page included in this 2018-2019 planner. Western United States map and States, Capitals & Time zones page in the end. Full 360 degree fold over 2018-2019 planner. What can you do with this appointment book 2018-2019? 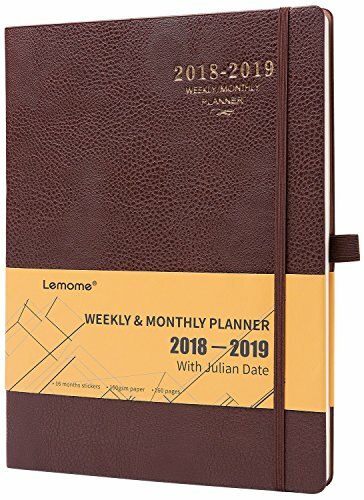 Agenda, gratitude journal, calendar, class schedule, meeting, goal planning, personal organizer, gratitude planner, track your workouts, meal plan, budget track, jots down ideas, write down wish lists, All-IN-1. And so much more is waiting for you to create it. Great gift for vegans. The paper is made from wood pulp of environmentally sustainable trees and we use recyclable, acid-free and no fluorescent paper. Anti-nearsighted paper is good for eyes. 40% - 60% thicker than normal 60 - 80gsm paper agenda planner Thickness: 100 gsm Pages: 80 Sheets / 160 Pages Size: 8.5 x 11 x 0.6 inches Do yourself a favor and buy this Planner for your creative life! ★ TIME PRODUCTIVITY & MANAGEMENT - May 2018 - June 2019, featuring 14 months of weekly and monthly pages with julian date. The festival will be marked on the corresponding date. 2018-2019 yearly holidays included in the planner 2018-2019. ★ Faux leather soft cover planner 2018-2019, excellent texture. Thicker and off-white paper planner is resistant to a passionate artist (bleeding, erasing, and shading), which can adequately protect your eyesight. No pollution, acid-free, environmental. ★ Elastic closure + Pen loop is always available for your pen and held well + Bookmark + Free calendar stickers + Gift box + Inner pocket - 8.5 x 11 in. If you have any questions about this product by planner 2018-2019, contact us by completing and submitting the form below. If you are looking for a specif part number, please include it with your message.